Writes like a pen and paints like brush Swirls, doodles, fine lines, and broad brush strokes are possible with this flexible brushtipped pen. Create "water color" looks, fill in broad areas fast, combine with silk ribbon embroidery. Pigment based, archival quality ink chemically stable, waterproof, and fade resistant. 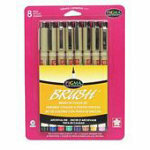 Set includes 8 colors: Black, Blue, Red, Green, Brown, Purple, Rose Orange.